A few years ago, we in the CHMS Library were made aware of John Flanagan's Ranger's Apprentice series by one of our great readers. Thanks, Will! We were also lucky enough to have his family donate several books in the series to the library. It was then that we noticed some interesting differences in artwork for the series. Will's family was so into the series that they didn't want to wait for the Australian author's next book in the series to be published in the U.S. Instead, they would buy it from an Australian online bookseller. The Australian covers always looked quite different from the covers for the American editions. 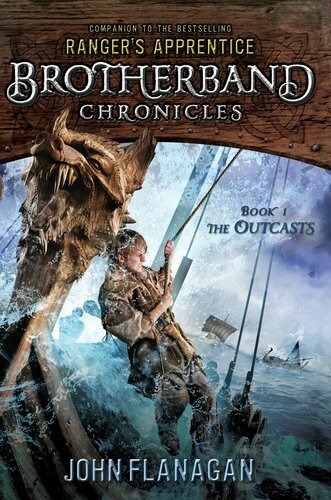 Now that John Flanagan has a new series out, The Brotherband Chronicles, it's time again to look at the differences between the Australian and American editions. What do you notice about these covers? Pay attention to the artwork, the lettering, the placement of words and names. What might account for some of the differences? And which one is from the Australian edition, and which one is from the American edition?